At last, found a replacement for the Benchtop Liquid Nitrogen Transfer Vessels that was broken. 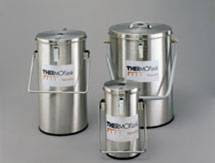 It is called "Thermoflask Thermolyne" Benchtop Liquid Nitrogen Transfer Vessels. It comes with a secured lid (there are locks to ensure the lid is closed when transporting liquid nitrogen) and there is a Vent on the top so no worry about building up pressure inside. So far so good. I am happy with the purchase.